Leaking Primary; Big Red Visits Glendale Harley Shop; Nietzsche and Motorcycles; My Best Tough Biker Dude Photo. Leaking Primary; Big Red Visits Glendale Harley Shop; Nietzsche and Motorcycles. My Best Tough Biker Dude Photo. Every Harley owner can verify the truth of this proposition simply by pointing to the wet spots on the concrete under their bike. She leaks, you fix her, she leaks again, you fix her, ad infinitum. An eternal recurrence. I don’t know about you but Nietzsche’s idea of the eternal recurrence means to me that I can be more patient with myself, the bike and the dealers that keep fixing it. It’s a kind of fate. 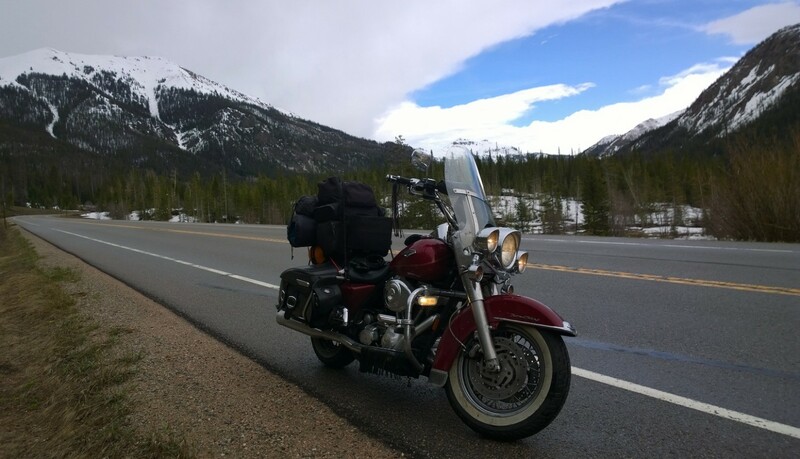 Because I had major work on Big Red at the Cartersville, Georgia Harley dealer before I left I elected to just monitor the situation and take her back to them when I completed the last 2600 miles (over 4100 kilometers) of my journey. Check her now and again and top up the transmission fluid. She was leaking a few years ago when I went through Death Valley and I survived. So the nice folks at Glendale Harley and I decided just to get the bike’s oil changed and the transmission fluid topped up. They were graceful and helpful since I was a traveler, fit me into their busy schedule and had me out in a few hours. I met a nice fella named Rick who worked in sound in Hollywood. We exchanged stories about trips and near misses, actual collisions and how, regardless, we love the exhilarating feel of riding a motorcycle. Really nice fellow and we wished each other safe riding and God bless. I thought of Nietzsche the other day as well when I stopped to take a photo at the Bixby Bridge in Big Sur on the Pacific Coast Highway. I think I posted that photo in a recent blog entry. The specifics from Wikipedia: “The bridge is 714 feet (218 m) long, with 45% of the roadbed above the arch; 24 feet (7.3 m) wide; over 280 feet (85 m) high; and has a total span of 320 feet (98 m).” I just know that she’s beautiful. I don’t know about you but freedom is something I constantly think about. ← Off the Motorcycle: What’s up Now? Oily wet spots are ever present under my 1961 VW Beetle convertible. I accepted this as evidence of the truth of Nietzsche’s “eternal recurrance” concept. Over the years I’ve learned that the wet spots are actually evidence of the Beetle’s instinctual drive to “mark territory” in the same way a male German Shepard marks territory by lifting a hind leg and leaves his signature with a well-placed wet spot. In the case of the Beetle, other dogs are put on notice that this territory has been claimed-so watch out! I suspect the wet spots under Big Red represent the same. Whether it’s a Harley, a VW, or a dog, it’s really all the same phenomenon. I think about freedom all the time, too. When I do, I always remember what Kris Kristofferson and Janis Joplin said in Me and Bobby McGee: “Freedom’s just another word for nothing left to lose……” Maybe that’s true for some folks-but it’s not the truth for me. Freedom is a privilege that is often under-appreciated. That is, until it’s gone. Then everyone is thinking about it.